Having finished writing about the space elevator, I am moving on to another spacelaunch method in this new article in the non-rocket spacelaunch series. Tether propulsion consists in using long, very strong cables (known as tethers) to change the velocity of spacecraft and payloads. 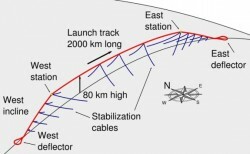 The tethers may be used to initiate launch, complete launch, or alter the orbit of a spacecraft. This form of propulsion would be significantly less expensive than spaceflight using modern rocket engines. 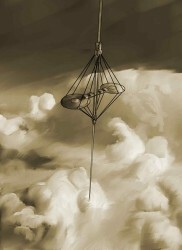 Artist’s conception of satellite with a tether. Tethers are kept straight by either rotating end for end, or by the difference in the strength of gravity over their length (tidal stabilisation). Tethers require strong, light materials. Possible such materials include crystalline plastics such as ultra high molecular weight polyethylene, aramid or carbon fiber. Another possibility is to use carbon nanotubes when the technology becomes available. 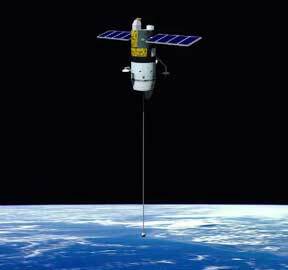 A momentum exchange tether is a rotating tether that would grab a spacecraft and then release it at later time. This can transfer momentum from the tether to and from the spacecraft with very little loss. A rotating momentum exchange tether is also known as a bolo. Another type of tether is an electrodynamic tether. It’s a conductive tether that carries a current that can generate thrust or drag from a planetary magnetic field, in much the same way as an electric motor. Most space tethers fall in two categories. They are called “skyhooks” if they are tidally locked and therefore always perpendicular to the Earth’s surface (though not necessarily geostationary). They are referred to as “rotovators” if they are not tidally locked. The skyhook’s name was coined by Italian scientist Giuseppe Colombo because it appears to be “hooked onto the sky” (due to the fact that it is tidally locked). 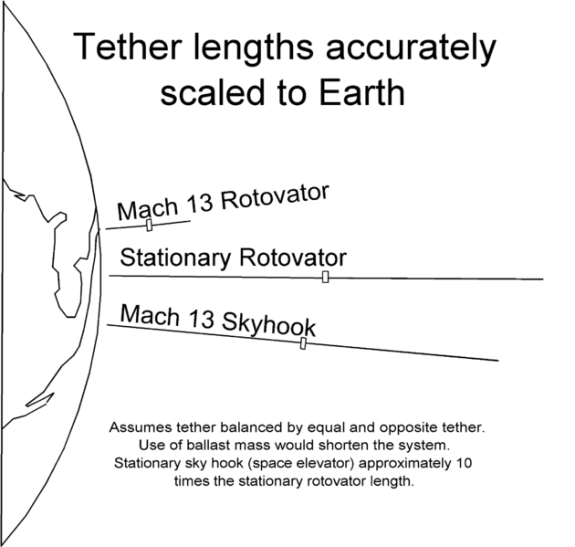 Short tethers are called “hypersonic skyhooks” because the tip nearest the Earth travels about Mach-12 to 16 in typical designs. Longer tethers would travel more slowly. At the limit of zero ground speed, it would no longer by a skyhook and be re-classified as a space elevator. An aircraft or sub-orbital vehicle transports cargo to the lower end of the skyhook and then, in most designs, climbers transport the cargo to the other end of the tether where it can take advantage of the momentum transfer. The word rotovator is a portmanteau derived from the words rotor and elevator. It is a high speed rotating tether, spinning so that the tips have a significant speed of about 1–3 km/s. The maximum speed is limited by stress tolerance and safety factor of the tether but it can be greatly increased if it is of thicker cross-section in the middle and tapers and is lighter, thinner at the tips (just like in a typical space elevator design). 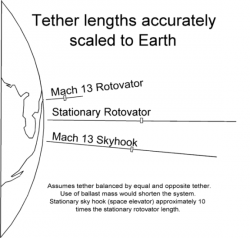 A spacecraft could rendezvous with one end of the tether, latch to it, and be accelerated by the tether’s rotation. The tether and spacecraft would then separate at a later point when the spacecraft’s velocity has been changed by the rotovator. Alternatively, the tether can also be used to slow down incoming spacecraft, thus increasing the rotational momentum of the tether. The momentum given to the spacecraft is not free. Unless the average momentum gained from inward traffic equals that imparted to outward traffic, some additional energy is required to maintain a constant orbit and rotational speed. For example, solar panels generating current could be used for electrodynamic tether propulsion. 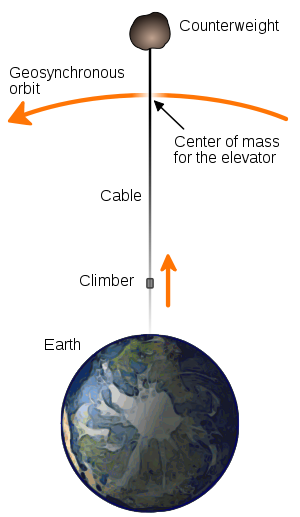 On bodies with an atmosphere, such as the Earth, the tether tip must stay above the dense atmosphere, or the atmospheric drag will cause it to loose speed and thus fall into a lower orbit, eventually crashing down to the surface. On bodies with reasonably low orbital speed and very little or no atmosphere (such as the Moon and possibly Mars), a rotovator in low orbit can potentially touch the ground, thereby providing cheap surface transport. Tethers have been tested in space in many missions since 1966, with Gemini 11. A second part to this article will focus on those tether satellite missions. The use of tethers in space poses many challenges and safety issues. A third part to this article will extensively examine all those issues. Space tethers are a popular theme in science fiction. A fourth and final part to this article will introduce you to the most famed science fiction works on the subject.